If you haven’t heard of Hidden Treasure, look them up on their website! 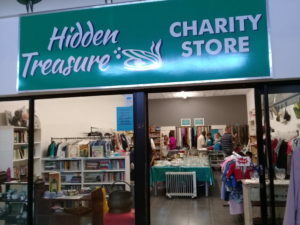 Hidden Treasure is an international ministry/charity shop whose purpose is to minister to those who shop there by providing low cost, gently used items, as well as to raise funds for a number of charities. The shop receives items to sell only through donations; and along with two managers, the shop is completely staffed by volunteers. Bethesda Outreach is associated with the Hidden Treasures charity shop in the Waterglen Center, Pretoria, which was started a year ago. 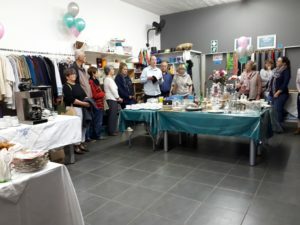 This shop is the combined effort of Waterkloof Baptist Church and Central Baptist Church, both of which are longtime supporters of Bethesda. The proceeds of the sales every month are donated to us at Bethesda, as well as to the Glenhaven Retirement Centre, a ministry of Central Baptist Church. I am fortunate to be able to volunteer at the shop one Friday afternoon a month, and also seem to be a conduit for many donations on their way to Hidden Treasure. I love the opportunity to serve alongside others who desire to serve God by volunteering their time and energy in the shop. On the 4th of August, some of us from Bethesda were privileged to celebrate one year of God’s goodness and blessing on this amazing ministry. We celebrated along with those who had the vision to begin the ministry and those who serve faithfully in the day-to-day operations of Hidden Treasure. The children of Bethesda have benefitted greatly from these people’s sacrifice and through their love for the most vulnerable in our society: the widows and orphans. What a blessing it is to be a part of the body of Christ.